I don’t know about you but I am very easily diverted from what I should be doing and I am always looking for some distraction that will allow me to postpone diving into the to do list. The internet is a veritable treasure trove of such distractions and it was there I happened upon a site called draw a stickman. 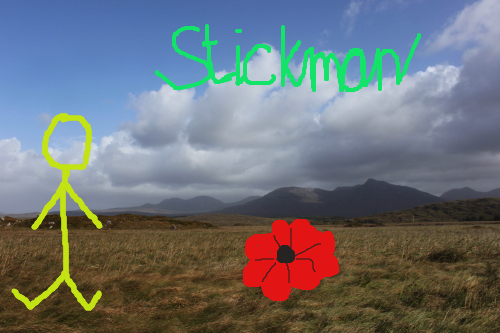 You may of course have found the site yourself but if not and you would like to create your own stickman and see him come to life and take part in an adventure click here. I am telling you about him not because I wish you to become a profligate time waster but because the process of creating stickman left me with a happy feeling. Note: I found the draw a stickman site via a life less orderly. Clearly I am never short of ways to waste time as it is, but it’s always good to find *new* ways to do so; it resembles progress and change without my having to actually commit to either of those, right? I thing I mostly like the escapism of interesting diversions.